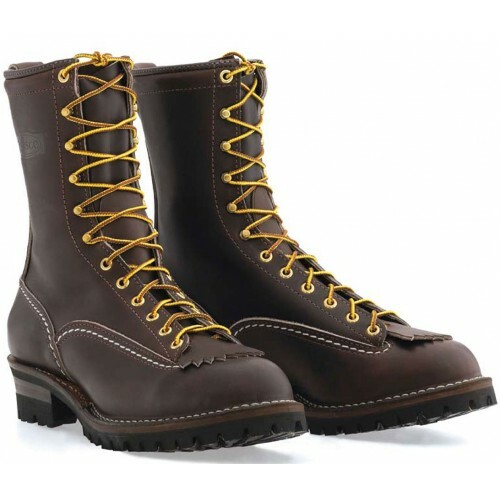 The brown Jobmaster is one of Wesco's finest, versatile, leather work boots. Ten inches of quality means never worrying about your feet, whether you are doing construction work, hiking, or just plain walking. One of the downfalls of most boots is that they aren't versatile enough to carry you through a variety of situations. The Jobmaster, with its seven ounces of full-grain leather, is Wesco's versatile boot designed for every occasion. These Wescos are suitable for anyone from lumberjacks to coal miners. Whether you down in the caves or carving up a tree, these boots are designed to withstand the harshest of conditions and treatment. Heavy, white stitching compliments the full-grain leather to create a boot ready to take on the toughest work imaginable. PORON performance enhancing shock absorbing inserts also help take the load off your heels. Slipping on logs or wet rocks will be a lot harder when the 100 Vibram lug sole on the bottom of the Jobmaster makes contact. The sole on this brown beauty will prevent you hurting yourself or your foot while out on the job or on a hike, and the color can even help with blending in for you hunters out there looking to camouflage yourselves. Brass hardware gives these working boots a small blast of fashion as well. For those of you who have problems getting through the day without sweat embarrassing you, Wesco has added in a sweat-resistant insole. Trekking through some water won't be as much of a hassle either as these boots are water-resistant. 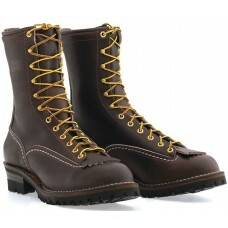 The brown Jobmaster is a great work boot that will get you through a variety of situations with your feet intact. Hikers, hunters, and working people the world over swear by the Wesco Jobmaster as their go-to boot. If you prefer black, however, feel free to look at the black Jobmaster boot.